Place fish pieces in a bowl, add the minced garlic and lime juice so that the pieces are well coated. Sprinkle generously all over with salt and pepper. Keep chilled while preparing the rest of the soup. 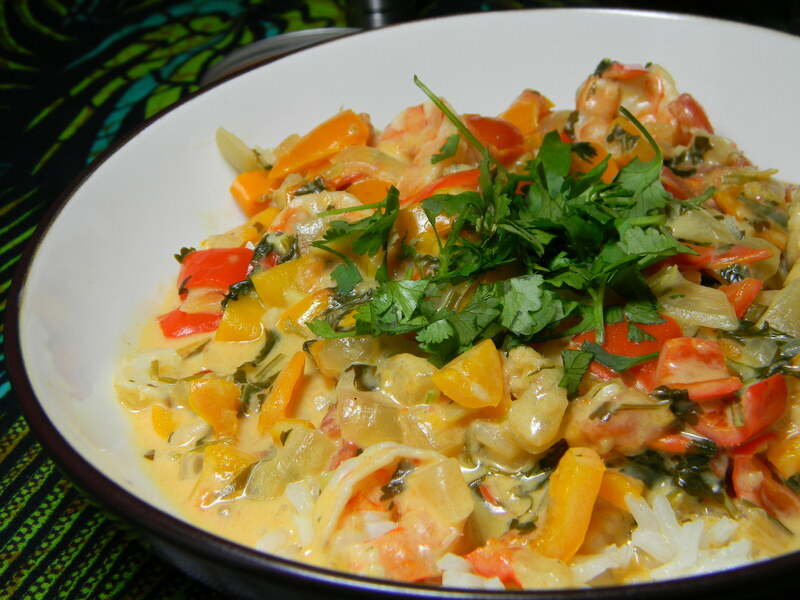 There’s a special rice recipe that goes with the moqueca- either scroll down to see that recipe or begin a regular rice preparation now. Going back to the soup: In a large covered pan, coat the bottom with about 2 Tbsp of olive oil and heat on medium heat. Add the chopped onion and cook a few minutes until softened. Add the bell peppers, paprika, and red pepper flakes. Sprinkle generously with salt and pepper. Cook for a few minutes longer, until the bell pepper begins to soften. Stir in the chopped tomatoes and onion greens. Bring to a simmer and cook for 5 minutes, uncovered. Stir in half of the chopped cilantro. Use a large spoon to remove about half of the vegetables (you’ll put them right back in). Spread the remaining vegetables over the bottom of the pan to create a bed for the fish. Arrange the fish pieces and the shrimp on the vegetables. Sprinkle with salt and pepper. Then add back the previously removed vegetables, covering the fish. Pour coconut milk over the fish and vegetables. Bring soup to a simmer, reduce the heat, cover, and let simmer for 15 minutes. Taste and adjust seasonings. You may need to add more salt (likely), lime or lemon juice, paprika, pepper, or chili flakes to get the soup to the desired seasoning for your taste. Garnish with the rest of the cilantro. Serve with rice or with crusty bread and ENJOY! *You could also use a regular red and yellow bell pepper, diced. Add the boiling water. (The amount depends on your brand of rice, check the package. If no amounts are given, add 1 3/4 cup of water for every cup of rice.) Stir in 1 teaspoon of salt. Bring to a simmer, then lower the heat, cover, and let cook for 15 minutes, after which, remove from heat until ready to serve with the soup. We largely based our recipe on the one found here. This looks wonderful and sounds even better. Will try it this weekend.